Until his 70th birthday in 1963, Joan Miró was best known for his surrealist paintings and drawings. However, in the last two decades of his life he created more than 150 sculptures. These late works mostly fall into two categories: those cast from forms created by the artist, and those cast from found objects. One of Miró's largest sculptures, Personnage Gothique relates to both types: the bird was cast from an object the artist created, while the top portion was cast from a cardboard box and the arch-shaped form from a donkey's collar. The objects combine to suggest a figure, while at the same time the empty box and unoccupied harness imply absence. Personnage Gothique embodies Miró's lifelong concern with richly imaginative imagery that he said was "always born in a state of hallucination." 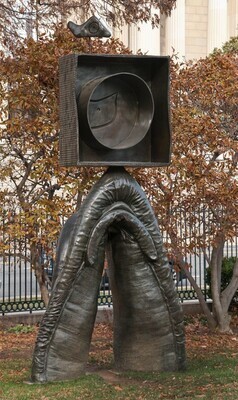 Purchased from the artist by Aimé Maeght, Paris; (Galerie Maeght, Paris); purchased 12 June 1992 by NGA. Apparently Aimé Maeght liked the small maquette the artist made of the work, and agreed to buy the cast numbered 2/2 of the large version Miró wanted to do. This cast was the only one completed in the artist's lifetime. (See letter of 9 October 1991 from Shane Dunworth to Jeremy Strick, in NGA curatorial files). The credit for the loan of the sculpture to exhibitions in 1979, 1981, and 1986-1987 is to Galerie Maeght, Fondation Maeght (Saint-Paul), and Mr. and Mrs. Adrien Maeght (Paris), respectively. Joan Miró: Peintures, Sculptures, Dessins, Céramiques 1956-1979, Fondation Maeght, Saint-Paul, France, 1979, no. 308, repro. Miró Milano: Pittura, Scultura, Ceramica, Disegni, Sobreteixims, Grafica, Palazzo del Senato (and other venues in Milan), 1981, unnumbered catalogue, repro. Miró: Escultor, Centro Reina Sofia, Madrid; Fundacio Joan Miró, Barcelona; Museum Ludwig, Cologne, 1986-1987, unnumbered catalogue, repro. Cigola, Francesca. Art Parks: A Tour of America’s Sculpture Parks and Gardens. New York: Princeton Architectural Press, 2013: 101.